Established in November 2003, School of Foreign Languages of NCEPU consists of English departments in campuses of Beijing and Baoding. School of Foreign Languages now has the master-degree authorization for the first-level discipline of foreign languages and literature and the master-degree authorization for interpreting and translation, with the establishment of two secondary disciplines of the English Language and Literature, the Foreign Linguistics and Applied Linguistics and two professional fields of English Translation and English Interpreting. School of Foreign Languages offers two undergraduate programs, English and Translation. The recruit of the students for the major of English in undergraduate level has begun since 2001, that of the students for the major of English language and literature in postgraduate level since 2002, that of the students for the major of translation and interpreting in postgraduate level since 2011 and that of the students for the major of translation and interpreting in undergraduate level since 2015. Each year, the number of undergraduate students recruited is more than 120, that of postgraduate students recruited more than 50, and that of the schooling students is 571. There is 132 teaching and administrative staff in School of Foreign Languages of NCEPU, of whom, 119 are full-time teachers, including 12 professors and 37 associate professors and 64 teaching fellows, and the number of the full-time teachers having a doctorate is 18 and the proportion of our teachers possessing a master and higher degree or a postgraduate qualification is above 81%, and 42% of them have the overseas learning experiences. 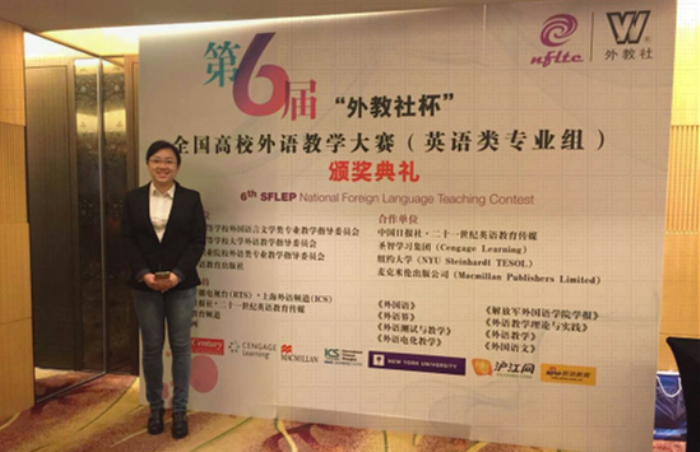 One teacher is selected as the Teaching Famous Master of NCEPU, 43 teachers chosen for the Teaching Famous Master Development Program and 5 teachers promoted for the "Beijing Youth Talent Program" in School of Foreign Languages. The number of postgraduate tutors in our school is 29 and a number of teachers have won provincial and national awards in teaching competitions. A teaching staff has been formed with the rationally-structured education background and professional title, the great teaching professionalism and the high-level teaching and scientific research in our school. School of Foreign Languages adheres to teaching as the center and taking teaching quality as the development path, undertaking the non-major foreign language teaching, which involves five foreign languages such as English, Japanese, Russian, French and German for the undergraduate and postgraduate students majored in English or translation and interpreting and for all the students under doctor, master, bachelor and correspondence education. 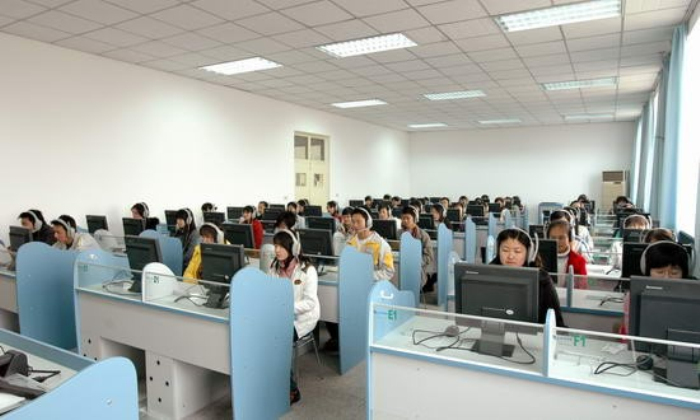 In recent years, our school is continuously deepening the teaching reform to explore the innovative teaching models, successively bearing the teaching reform projects of and above the provincial level such as the Beijing boutique video open courses, the Beijing municipal educational reform and awarded the Teaching Achievement Prize of Chinese Ministry of Education. 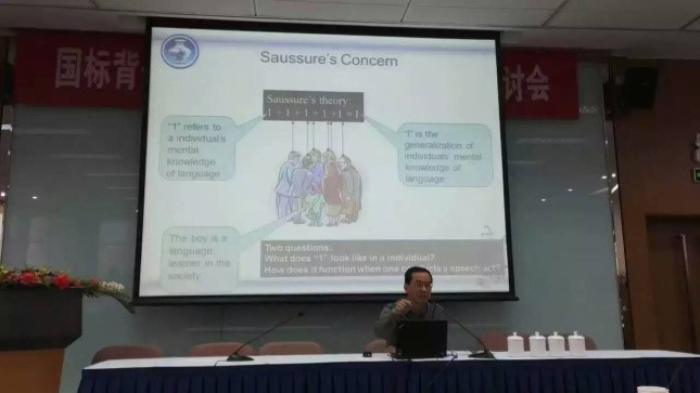 Besides, our school attaches high importance to the academic and scientific research, assuming the Humanities & Social Sciences Planning Projects of Ministry of Education of China, the Humanities & Social Sciences Youth Fund Projects, Beijing Philosophy and Social Sciences Planning Projects and having published many academic monographs, textbooks and academic papers in core journals at home and abroad, including SSCI retrieval, A&HCI retrieval, etc. School of Foreign Languages persists in the educational concept of learning to meet practical needs, thinking highly of the teaching practice for students majored in foreign languages and the construction of the second classroom for extracurricular teaching activities. 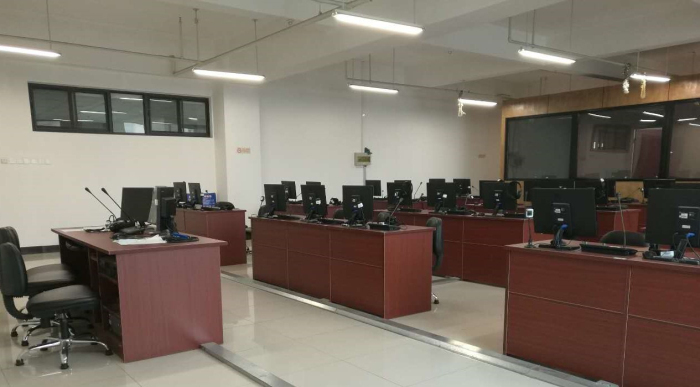 Currently our school has foreign language teaching practice bases of all sorts including the Electric Power Planning and Engineering Institute, China LONGYUAN Power Group Co. Ltd, GTC Technology Co. Ltd, etc. and launches various second classroom activities of the classic brands such as NCEPU English Culture Festival, Mayi Translation Studio, etc. Through a range of contests orienting to all the students of NCEPU, like English Speech Contest, English Writing Contest, English Reading Competition, English Translation Contest and English Drama Contest to create a strong atmosphere of learning foreign languages for students. 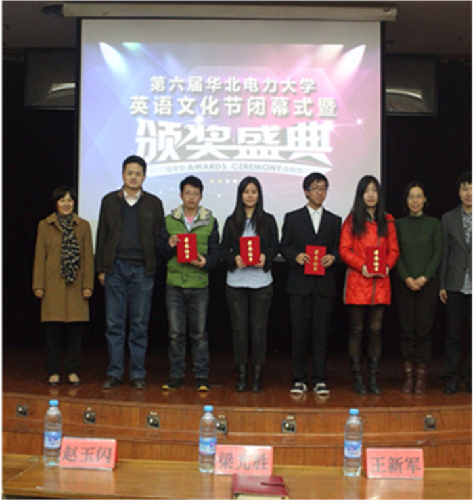 They have won awards in all kinds of national foreign language contests, showing the elegant demeanors and language-learning competence of NCEPU students. School of Foreign Languages lays emphasis on consolidating a solid foundation of English language for students and fostering their abilities of skilled listening, speaking, reading, writing and translating with certain practical working abilities. After graduation, our students mostly work in the offices or departments of the Party and government organs, public and administrative institutions, culture and education enterprises, electric power production corporations, trade and travel companies and so on. In recent years, the employment rate of the undergraduate and postgraduate students in our school is around 95% and that of the undergraduate students’ taking part in and passing the postgraduate entrance exams and going abroad for further study is rising year by year. 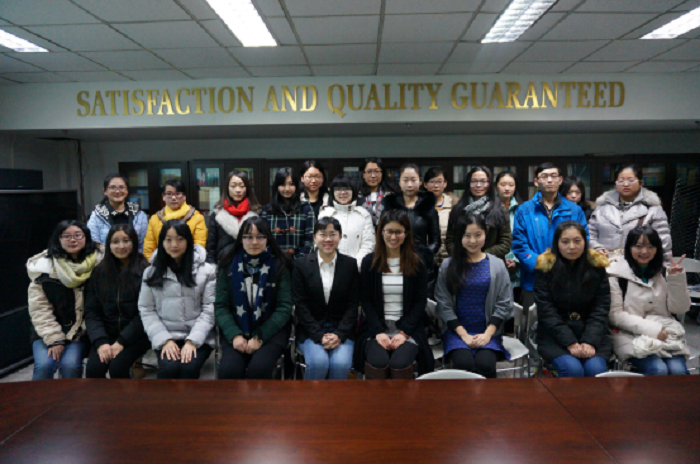 Our graduate students have been successively admitted into Beijing Foreign Studies University, Shanghai International Studies University, Beijing Normal University, Zhongshan University, Tsinghua University and other universities to further study in the majors of foreign language, law, political economy, education, etc. for their postgraduate degree. Some of our excellent graduate students are employed by the Ministry of Foreign Affairs, Ministry of Public Health, Tencent, Shandong Nuclear Power Co. Ltd, TBEA Co. Ltd, Foreign Language Teaching and Research Press, China National Petroleum Corporation, New Oriental Education and Technology Group, etc. Favorable conditions have been provided for the teaching and research in our school with 16 modern digital language laboratories, 20 multimedia classrooms, 2 simultaneous interpretation laboratories, 1 translation laboratory, 2 reference rooms. Guided by the 13th Five Year Plan, School of Foreign Languages will advance with the times, strive for the factualism and innovation, reform with keen determination to play a supporting role in the construction of the multi-disciplinary, research-oriented, internationalized and high-level university.